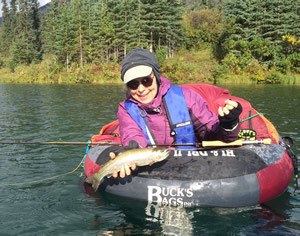 Another Adventure Denali Delight, August, 2016 Just when we thought that our Adventure Denali float tube trip couldn’t get any better, the fish showed us otherwise on our August trip this year. Fish of all sizes were incredibly cooperative as they took a variety of nymphs & streamers of all different sizes and colors. The fish in Chavey lake are getting used to us fishing amidst them in the tubes, I think, and I’m sure that they have realized that we are not going to kill them. They actually follow us as we paddle around the lake, looking like large, dark, shiny, torpedoes. Smaller Arctic grayling swim among the rainbows, and take our flies as eagerly as the larger fish. 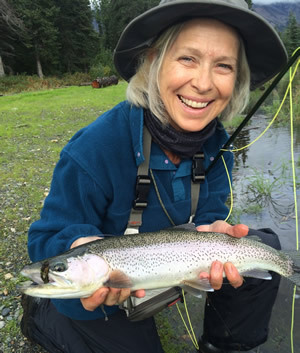 Lyn started out quickly with a nice twenty-incher for her first fish of the day, and just kept going from there. This was her first encounter with a float tube, and she was getting the technique of paddling quickly. Just about to lose this nice fish because she had slack in her line, I reminded her that she had to keep paddling to keep a fish tight in a tube. From there on she did a great job of playing all sizes of fish that we found in the lake. We spent the morning of our second day fishing the middle lake, which is fished from the shore, and after learning how to avoid the weeds and bushes behind her she caught some really nice fish. Reminiscing about fish she’d caught as a girl, she kept comparing the present fish to these. After a couple of hours the bugs were torturing us so much that we had to return to the cabin for more bug repellant and our head nets. Just as we always do, we headed for the third lake the next day. 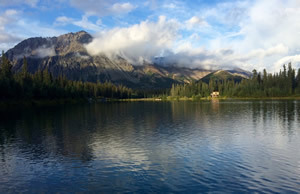 Kirk Martakis, the owner of Adventure Denali, has been working on creating an easy entrance to this lake for the float tubes. It is now possible to back into the water slowly because the incline is not so steep. 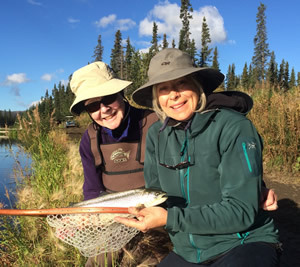 It wasn’t five minutes after we started fishing that the rods were bent with the wonderful Arctic grayling, who were practically inhaling the gold-ribbed hares ear and pheasant tail nymphs we were fishing with. Schools of fish in the 12-inch range made it fun to cast, release the fish, cast again and in a couple of minutes have another one, right after the other. It was easy to find them all around the lake because they were feeding on emergers and making rings everywhere on its surface. It’s really fun to play with them as they give us a classic grayling fight with that amazing, spotted, beautifully-raised dorsal fin. Larger fish were definitely around as well. A gorgeous 16-incher appeared from a shady spot below an overhanging evergreen and put up a series of jumps before coming to the net. Several even larger fish struck a Czech-nymph that we were using. It managed to escape before we could land him and take a measurement, though. Rainbows also made an appearance on third lake, and we could always tell when we had one. The “take” was usually harder, and the quick jump that nearly always signals a rainbow hook-up occurred almost every time. They are not usually as large as the fish in Chavey Lake because they have just recently been planted in third lake by Kirk, who is now using fish from Chavey to increase the number of bows in this lake. Since we would just be fishing the morning of our last day, we had deflated and packed up the float tube paraphernalia the previous evening before heading into the cozy Beach Cabin for dinner. It was a chilly night and the heaters were on in both the cabin and in my van. The next morning was crisp and sunny, but we had to put on warm clothes to fish. The fish on middle lake were ready for us and our nymphs as soon as we wet a line. 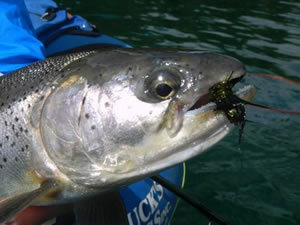 Soon, however, they seemed to quit, so we switched our flies to size eight bead-head lake leeches in olive and brown. That definitely turned the bite back on. A number of 20-24 inch fish were happy to play. We will definitely be returning to Chavey Lake next year, and, whether or not you’ve ever used a float tube, you’ll fall in love with this special place and it’s very special fish! Watch for the trip dates in our monthly newsletter.